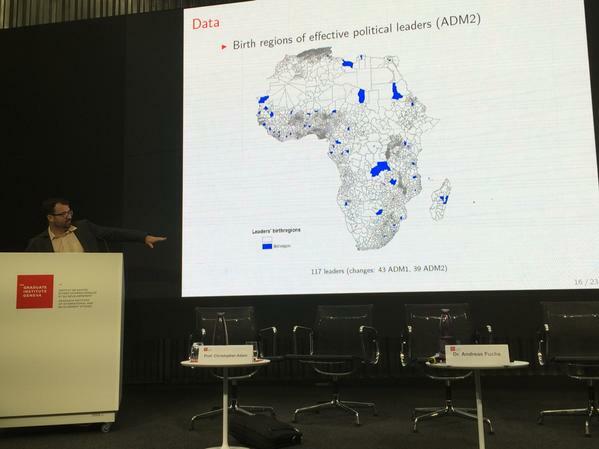 International Conference on the Past, Present and Future of African-Asian Relations, University of Neuchâtel, Switzerland (04/2019), Keynote Speech "China's development aid to Africa and its consequences"
Hamburg Lecture on Law & Economics, University of Hamburg, Germany (11/2017), Does Aid Help Refugees Stay? Does Aid Keep Refugees Away? 10th International Conference on "Migration and Development", Center for Research on International Development (CERDI), Clermont-Ferrand, France (06/2017), Does Aid Help Refugees Stay? Does Aid Keep Refugees Away? Conference “Development, Trade and Investment” of the Stockholm China Economic Research Institute, Stockholm School of Economics, Sweden (08/2016), The Dalai Lama Effect Revisited: How Do Importers Respond to Political Tensions? CSAE Conference 2016: Economic Development in Africa, University of Oxford, UK (03/2016), Aid on Demand: African Leaders and the Geography of China's Foreign Assistance & Do Development Minister Characteristics Affect Aid Giving? Beyond Basic Questions Workshop, Leibniz University Hannover, Germany (06/2015), State Control and the Effects of Foreign Relations on Bilateral Trade & Do Development Minister Characteristics Affect Aid Giving? Annual Conference of the Verein für Socialpolitik Research Committee Development Economics, Kiel Institute for the World Economy, Germany (06/2015), Aid on Demand: African Leaders and the Geography of China's Foreign Assistance & Do Development Minister Characteristics Affect Aid Giving? International Conference on Globalization and Development, University of Goettingen, Germany (05/2015), Aid on Demand: African Leaders and the Geography of China's Foreign Assistance & Do Development Minister Characteristics Affect Aid Giving? Annual Meeting of the European Public Choice Society (EPCS), University of Groningen, Netherlands (04/2015), Aid on Demand: African Leaders and the Geography of China's Foreign Assistance & Do Development Minister Characteristics Affect Aid Giving? Annual Conference on the Political Economy of International Organizations, Hertie School of Governance, Berlin, Germany (02/2015), When Do Developing Countries Follow International Regulatory Benchmarks? International Economic Policy Research Seminar & AFRASO Lecture, Goethe University Frankfurt, Germany (01/2015), What Drives China’s Allocation of Development Finance Across and Within African Countries? Conference "Fragmentation or Pluralism? The organisation of development cooperation revisited", German Development Institute (DIE), Bonn, Germany (10/2013), Why Donors of Foreign Aid Do Not Coordinate: The Role of Competition for Export Markets and Political Support & Public Panel Discussion "Fragmentation or Pluralism in the organization of development cooperation: Policy implications of an evolving research agenda"
NORRAG Meeting, Bern, Switzerland (11/2010), Are 'New' Donors Different?